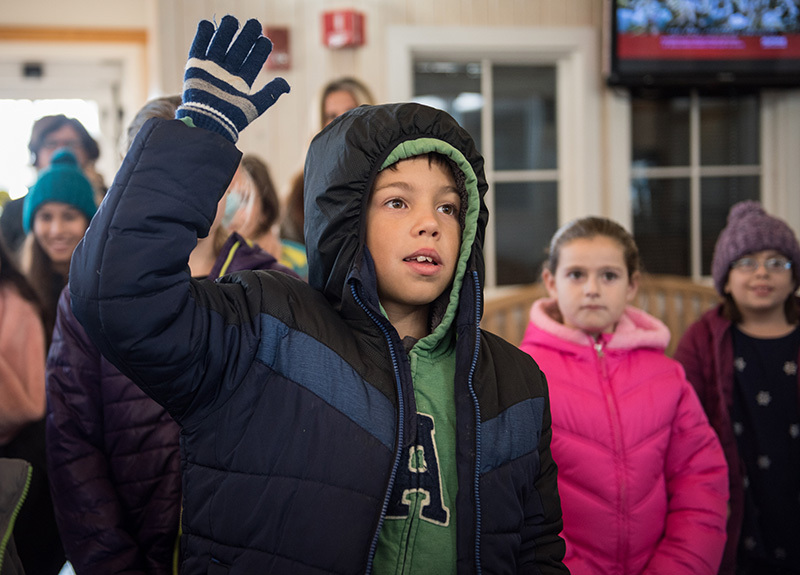 Field trip to airport lets Tisbury fourth graders see how important math is in everyday jobs. You all remember the old Chicago word problem? If one train leaves the station going 50 mph and a second train … Well, the same thing applies to planes. 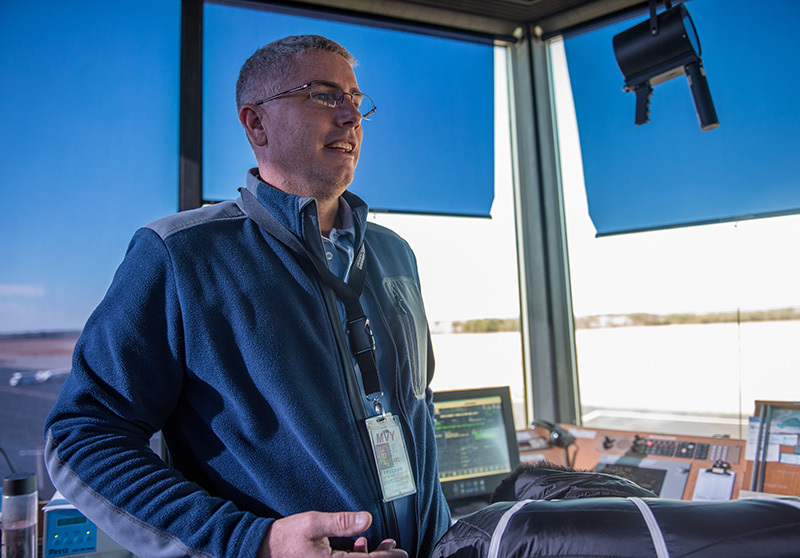 If one plane is located closer to Martha’s Vineyard, but is traveling at a slower speed than another plane that’s farther away, Rodney Dunbar, an air traffic controller, does a quick calculation before telling the two pilots which one will be cleared to land first. 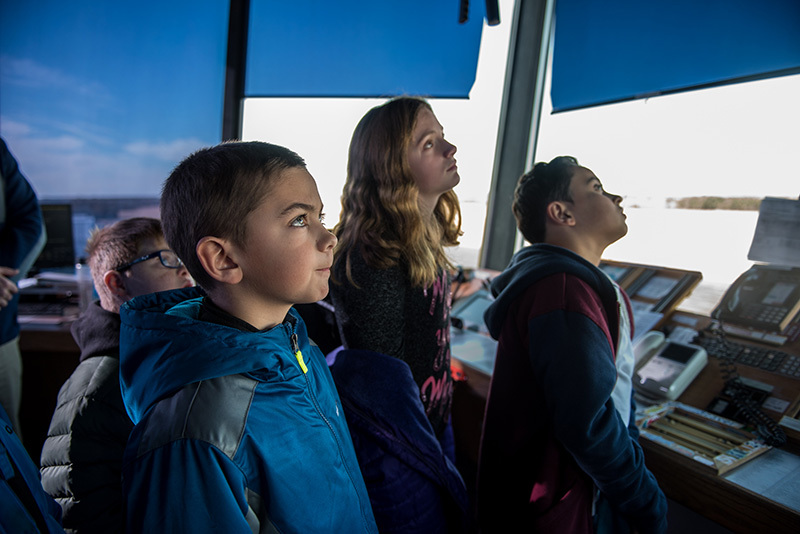 “Even though a plane is further out, if he’s going faster, he’s going to be here first,” Dunbar explained to a group of fourth graders standing inside the Martha’s Vineyard Airport tower. 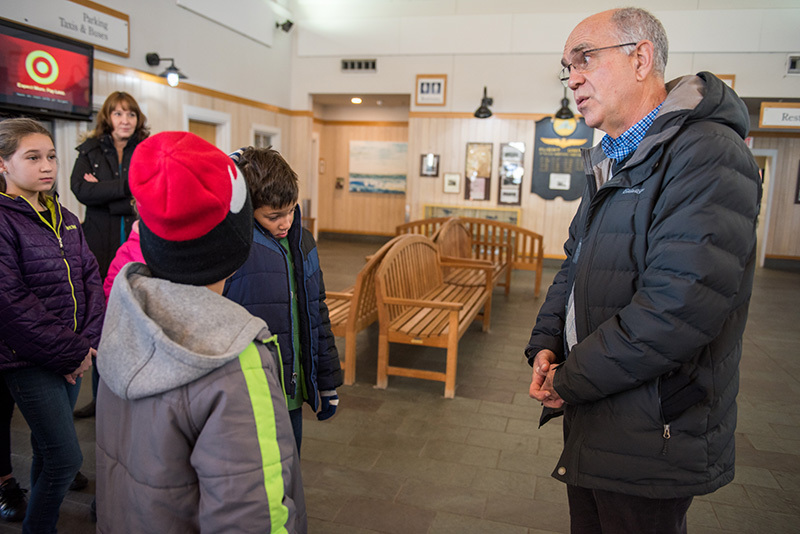 Two fourth grade classes from Tisbury School joined their teachers, Meredith Goldthwait and Hope Fecitt, for a tour of the airport Tuesday morning as the guests of Bob Rosenbaum, chairman of the Martha’s Vineyard Airport Commission. Rosenbaum also spends two days per week at the school tutoring math students in Goldthwait’s room, as well as in a second grade class. Rosenbaum’s idea was to show instead of tell the students just how vital math is to the jobs at the airport — from the pilots who have to figure out just how much fuel they’ll need to make their journey to the firefighters who have to know how much water a truck will hold, to the air traffic controllers who have to be able to figure out those vital details of when planes can take off or land. 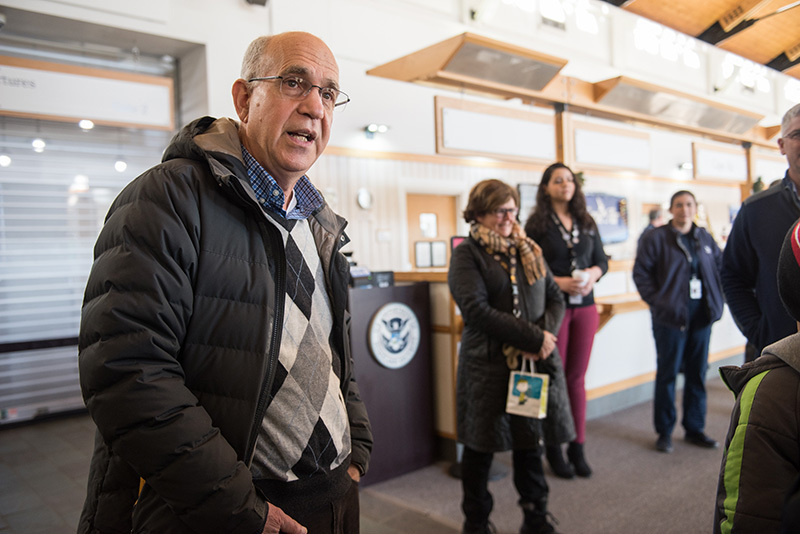 “The idea is to give you all an education as to how math is used in these jobs at the airport,” Rosenbaum said as he greeted the young students. Rosenbaum, who is a pilot, warmed up the students with a few math questions. What does a plane run on? “Electricity,” one of the students said, a hint of doubt in his voice. 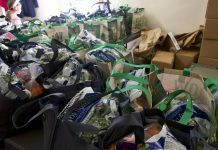 “No, not electricity,” Rosenbaum said. “Juice,” the student said, still doubting himself. And then Rosenbaum explained that if he planned to go 400 miles and his plane traveled 200 mph, he could get to his destination in two hours. Calculating the amount of fuel was a bit more complicated, because he would also have to factor in the weight of passengers and even how much the fuel weighs, he said. 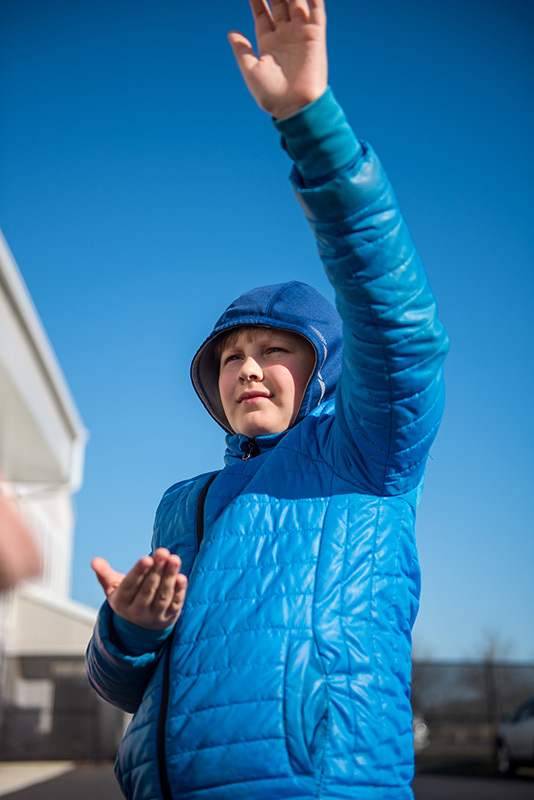 The two classes were divided into smaller groups (more math) and guided around the airport by staff members. 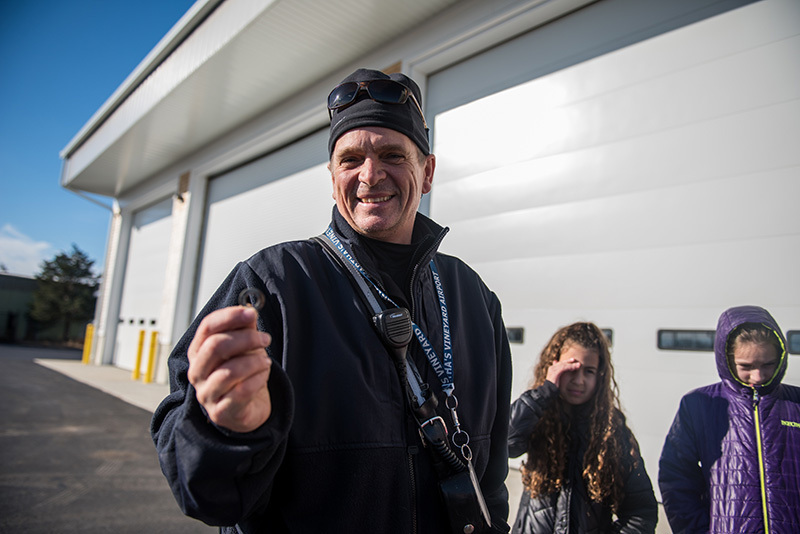 Inside the airport’s new building where fire trucks and snow removal trucks are stored, Kevin Gundersen, operations supervisor at the airport, showed a group of students one of the two fire trucks that are on standby in case of an emergency. At a brief stop in an equipment room with firefighting gear hanging on both walls, Gundersen asked how long it should take a firefighter to don the equipment. “Sixteen seconds,” one student responded. “That’s fast,” Gundersen said before explaining that firefighters strive to be ready in two minutes with their gear, and another two minutes with their air packs. “We time each other and have a competition,” he said. Sometimes that involves winning a T shirt. Inside the garage, there were huge trucks and more numbers. The larger fire truck, which wasn’t in the garage at the time, can pump 500 gallons per minute, Gundersen said. With a capacity of 1,500 gallons, the math was pretty simple. How soon would the truck be emptied? Three minutes. 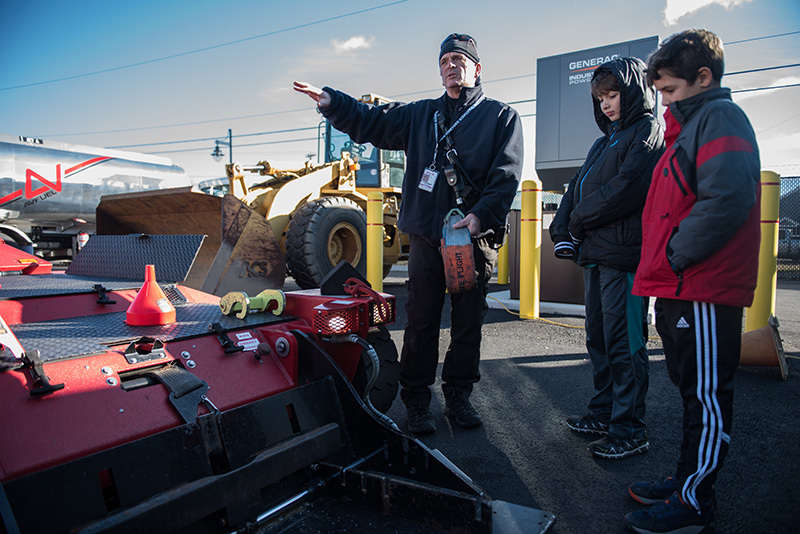 And the young students even got a little lesson in chemistry, as Gundersen explained why a firefighting foam is used to extinguish fires involving aircraft. 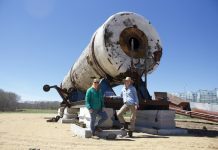 “It puts a blanket over the fuel to keep it from igniting,” he said, noting that it’s vapor and not the fuel itself that is burning. 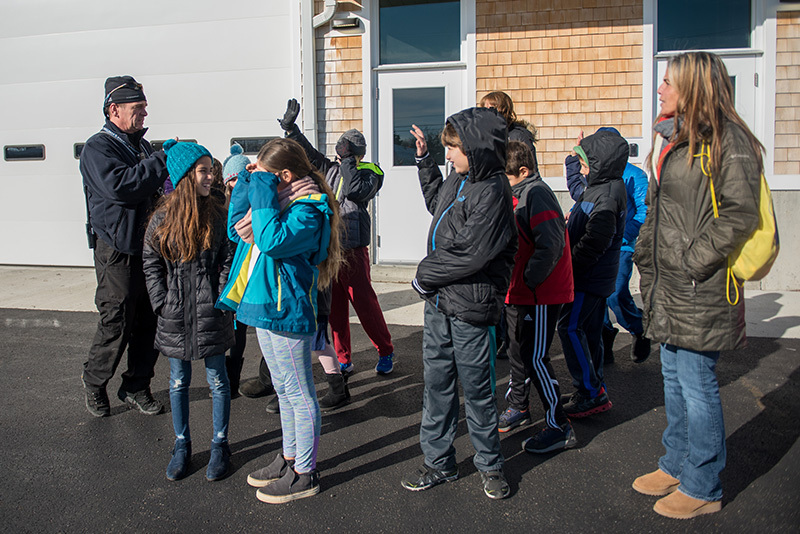 With Max Smith, a senior at Martha’s Vineyard Regional High School, at the airport Tuesday doing an internship, the younger students got to hear just what it takes to become a firefighter — the amount of education and training. More math. 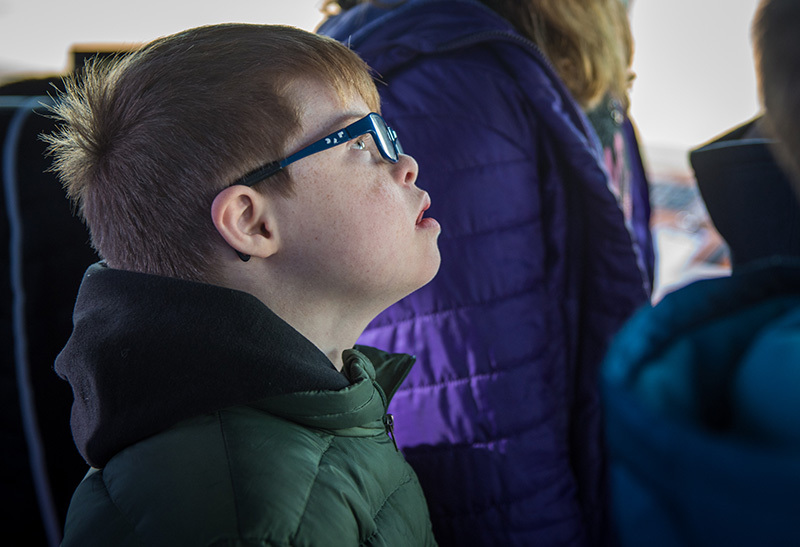 And Gundersen made their ears perk up when he explained it would cost about $1 million to replace the 2002 fire truck that they were looking at with a newer model. 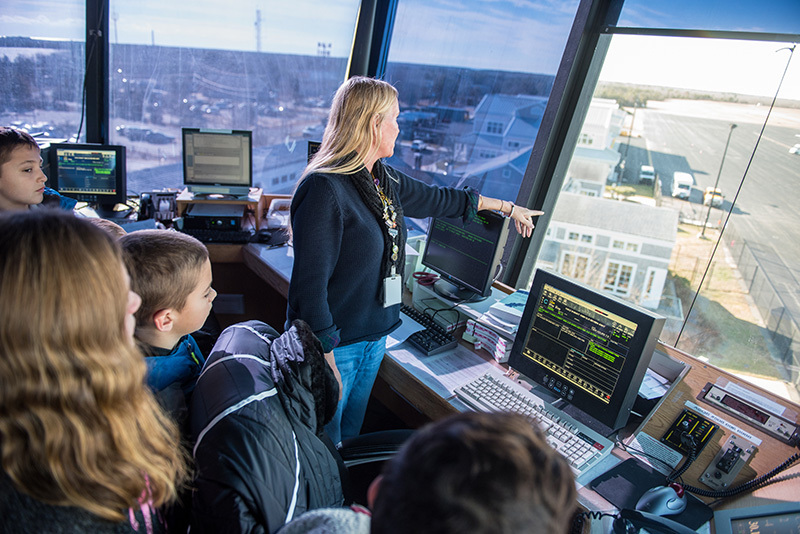 Back in the tower, tower manager Michelle Meyers explained that all types of weather numbers are monitored, because things like wind speed can factor in the conditions for taking off and landing. She also explained how important it is to get the information right, because they don’t want to mislead a pilot. 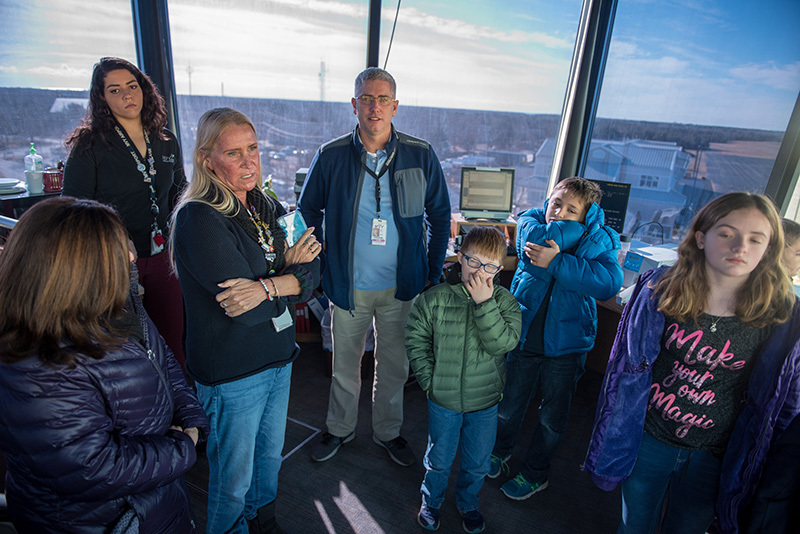 The students got to see two small planes take off while monitoring their altitudes and speeds on a screen inside the tower. Oh, and one more math problem before we’re done: We counted 67 steps up to the control tower and 67 steps down. That adds up to a lot of steps.